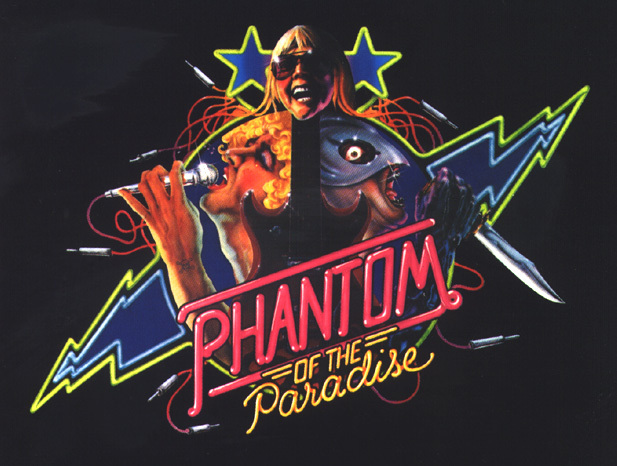 Phantom of the Paradise opened in the United States on October 31, 1974. "Opened" is used somewhat euphemistically, as the movie inexplicably played to mostly empty cinemas and was gone quicker than that year's Halloween candy. Phantom took a bit longer to make it up to the Great White North. The first anyone would have heard of it in Winnipeg was from a tantalizing ad placed in local papers on Saturday, December 21, 1974. "HE SOLD HIS SOUL FOR ROCK 'N' ROLL" the intriguing tagline promised. Who was this helmeted character standing before a keyboard, surrounded by what looked like pill bottles and recording equipment? Curious movie-goers fed up with leftover Christmas turkey would find out at noon on Boxing Day at the downtown Garrick cinema, where the film would play every two hours 'til midnight. It is presumed that those first audiences liked what they saw, for Phantom screenings soon became the stuff of local legend. Featuring Supersonic Stereophonic sound pumped from giant speakers more common to rock concerts, a massive screen and 820 magenta-and-purple seats, the luxurious 'op-art' Garrick cinema rocked out on weekends to packed houses singing along to every song and hanging on every synthesized word of Winslow Leach's doomed love affair with Phoenix. (This writer recalls attending a Saturday afternoon screening and literally tripping over many sets of legs in a desperate search for an empty seat.) It was not unheard of for a young Phantom fan to pay for a single admission at noon, only to stagger out near midnight having sat through six consecutive screenings...such was the reward for making it past the legendarily stern box-office gatekeeper, the Lady with the Big Red Glasses. Music and murder, thrice nightly. For a generation of kids who spent their Saturdays waking up to The Hilarious House of Frightenstein, eating dinner to The Bugs Bunny/Road Runner Hour, and going to bed watching Chiller Thriller, "getting" Phantom of the Paradise was a no-brainer. It made us laugh. It made us sing. It made us cry at the end. It made us want to be rock stars, or actors, or filmmakers ourselves. What more did any 10-year-old want in a movie? By late February of 1975, something was clearly happening. In the last week of the month, two ads appeared for sale of the brand new Phantom of the Paradise soundtrack album, which began flying off the shelves at downtown record stores like Kelly's, Mother's Music Explosion, Autumn Stone, Opus 69, and even their decidedly less hip neighbour, The Bay. The soundtrack continued to sell, and sell, and sell throughout March 1975. By day, across the city, elementary and junior high schoolyards were witness to our very own passion play, as we acted out scenes from the movie during lunch hours and recess (I was always Winslow, if you're curious). By night, we listened to the soundtrack until the grooves wore out, then received additional positive reinforcement from the seemingly ubiquitous TV ads playing late-night on CKY-TV. Helplessly caught in a winter-long feedback loop, we obeyed our media masters and saw Phantom as often as we could. Simply put, going to see Phantom of the Paradise was cool. These were good times. Written and directed by Brian De Palma. Released in 1974, same year as Zodiac's Red Phantom letter. "A disfigured composer sells his soul for the woman he loves so that she will perform his music. However, an evil record tycoon betrays him and steals his music to open his rock palace, The Paradise." For the record, Tanenbaum looks NOTHING like the Zodiac sketches as I also mentioned in the House of Zodiac thread. Interesting. Where was this movie filmed? Was it in theaters? JohnFester wrote: Interesting. Where was this movie filmed? Was it in theaters? Filmed in Beverly Hills. Not sure if it hit theaters, but I'm guessing it did not. Cool Phantom of the Paradise movie poster on sale! !